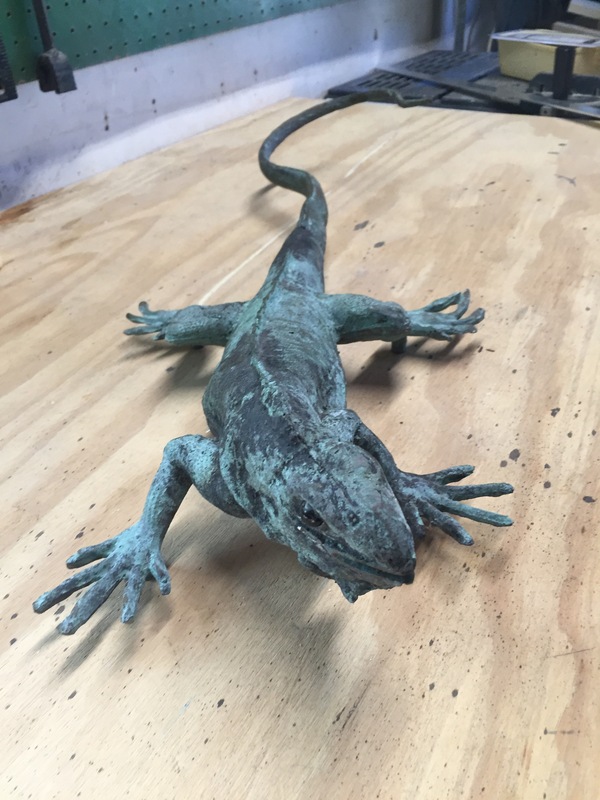 Several years ago, my wife’s mother gave her a life-sized metal iguana sculpture. She has always wanted it hung on our front porch wall. I’ve talked to several handymen about having it done, but most were unwilling to take the job, afraid of damaging the wall, the sculpture, or both. The only person who offered to try wanted to use epoxy to permanently affix it. That would have meant we couldn’t take it down if we needed to paint the house, so I declined the offer. This weekend, I decided to take a stab at the project myself. The feet had threaded screw holes, and I thought I might be able to make a mounting bracket that I could screw to the feet, and bolt the bracket to the wall. The first problem was that only one of the screw holes could securely hold a screw. The threads of two of them were completely stripped, and the third was in bad shape, too. The correct size machine screw fit, but if I wiggled it, it came right out. The next size up was too big and wouldn’t fit at all. I decided I’d deal with that problem once I made the bracket. I bought a piece of 1″ x 1/16″ aluminum, cut a 10” length, and drilled holes. I attached the bracket to the sculpture by inserting a sliver of wood between the screw and the side of the hole on the bad foot. It held, but it seemed a little shaky. Then I held the sculpture in place with one hand, and marked the spots for the hanger bolts with the other. Drilling the pilot holes and installing the bolts was easy, but I discovered that even though I’d taken precautions to be precise, the bolts were a fraction of an inch too far apart for the bracket. I thought I might be able to widen the hole enough to make it fit, but all I succeeded in doing was ruining the bracket. Oh, and the screw in the stripped hole fell out the minute I tried to redrill the bolt hole. I made another bracket, this time measuring carefully against the hanger bolts already in place. By chance, I drilled the holes to fasten the bracket to the feet a smidgen farther apart than the first bracket. That had the happy side effect of making it necessary to insert the screw for the semi-stripped hole at an angle, which made it secure in the hole. 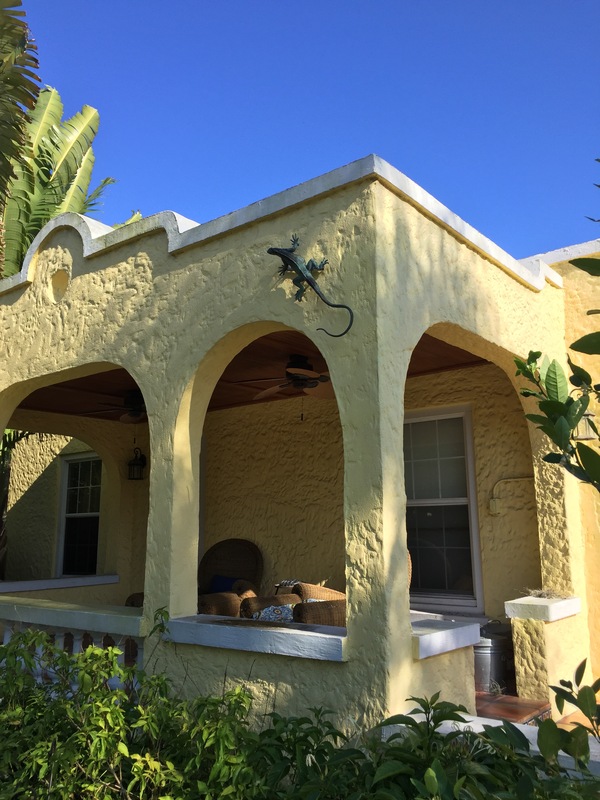 I slid the bracket over the bolts, secured it with wing-nuts, and now it looks like a live iguana is crawling up the front of our porch. And my wife is very happy.